We've been thrilling to the ride of Acer's Ion-powered AspireRevo for a couple of weeks now, and despite its diminutive size and price tag, there's plenty to talk about. The model we tested included an Atom 230 processor, 2GB of RAM, and a 250GB 2.5-inch HDD for what we've heard will carry a suggested retail price of $299. Check out our full impressions after the break. We love us a good out-of-box experience, and were mostly pleasantly surprised at our experience with the Revo -- minus one glaring shortcoming. The device has a small power brick, a helpful (if not incredibly firm) stand, and little else to worry about. We set it up next to our TV and naturally went for the HDMI port. Unfortunately, on first boot the Revo didn't want to go HDMI, and instead we had to plug in a VGA cable, and then switch to HDMI once it got comfortable. Luckily, the experience post-HDMI is flawless: the computer happily and helpfully pumps surround sound audio out through the HDMI cable, we literally didn't touch a thing to set it up in that regard. We plugged in the Lite-On Blu-ray drive included in our reviewer kit (a standalone product which will be available for $99 this summer), and Revo picked it right away, and before we knew it we were watching a Blu-ray movie with the pre-installed CyberLink PowerDVD 9 software. Our Revo came with a lot of pre-installed software that was nice for showing off Ion's capabilities, but "perks" like Google Desktop and the ultra-pervasive McAfee (it showed up in our clean install of Firefox in true crapware form) aren't very welcome on a machine that needs all the CPU headroom it can get. This is really a tale of two chips: the CPU and the GPU. Sadly, while we were very impressed with NVIDIA Ion's performance (it's basically the GeForce 9400m for cheap and low-power computers), the sluggish Atom 230 processor almost ruins it for everybody. The fact that Ion can run Vista is also a bit of a double-edged sword: accelerated interface elements like Aero Glass and Flip3D are great, and the windowing system is much snappier than traditional netbooks, but they come at the cost of an overall performance hit over running XP -- hopefully Windows 7 will arrive soon to save us from that conundrum. Startup is fairly quick, but the time to a "usable" desktop can be quite a bit longer -- it took us almost as long to open Firefox as it did to land on the desktop from a cold boot. Oddly enough, we found web browsing -- the supposed heart of a "net"top experience -- to be the most lacking. Sometimes we felt like we were having connection problems, and in fact Gmail at times would stop working entirely since it thought it was having so much trouble getting its packets through -- we seemed to fare better on Ethernet than with WiFi. Internet Explorer is a complete nightmare, but while we had a better time with Firefox and even better in Chrome, we wouldn't feel comfortable doing "heavy" browsing on the system on a daily basis. Video playback is the real winner here, with accelerated 1080p video in all sorts of flavors. Unfortunately, you have to know what you're doing. For instance, a 1080p QuickTime movie plays nice and accelerated in PowerDVD, but horribly in actual QuickTime, since it's not GPU-accelerated. Blu-ray movies also work great, but you have to wait through a sluggish start-up time and interface unresponsiveness of PowerDVD. 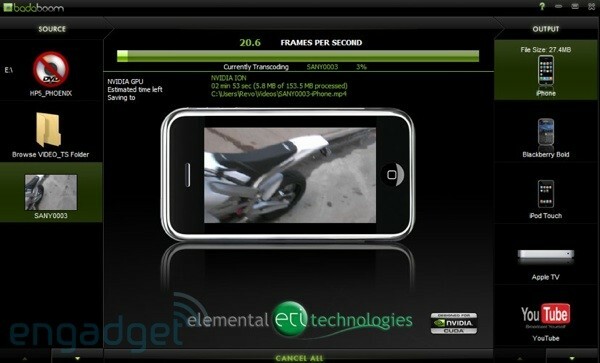 The slick CUDA-powered Badaboom transcoding software makes very quick work of hefty transcoding jobs, turning 720p camcorder footage into teensy iPhone-friendly videos in minutes -- one of the more impressive displays of Ion force. Unfortunately, Flash video playback was a real trial for the Revo. Hulu played fine at low-res inside a window, but when we went fullscreen it got all choppy. YouTube was surprisingly even worse, not managing a full frame rate at even low quality. With Flash video being one of the number one things people want to do with a media PC these days, it would behoove NVIDIA and Adobe to get things better accelerated here in the near future -- they both say they're working on it, but it's hard to tell when we'll get straight, pervasive GPU acceleration of Flash video playback, and we've gotten slightly conflicting reports from both sides on how the limited existing GPU acceleration in Flash 10 is supposed to work. Spore (after a rather long install process) plays great, with only a few minor slowdowns, and we'd imagine games like World of Warcraft would be very well suited to the system. 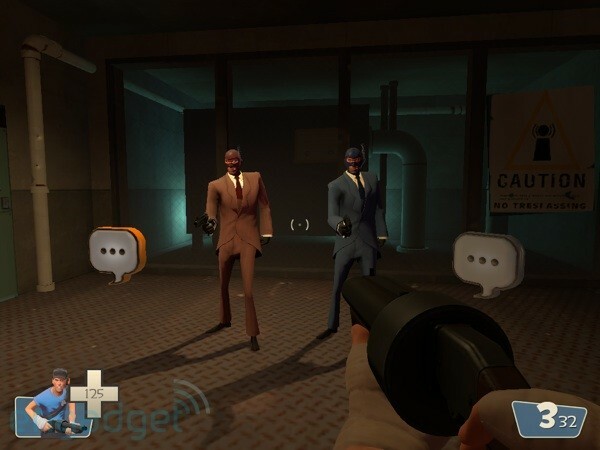 Unfortunately, while a game like Team Fortress 2 "runs," we'd hardly call it a livable solution without some severe downgrading in graphics and framerate issues. Despite all of these strains, the Revo was usually the quietest thing in our apartment, making it a prime candidate for the home entertainment jobs it's purposed for. Sadly, we encountered a bug at one point that made it completely mute, somehow shutting off the sound out through HDMI. A restart had us going again. The Revo is a really odd mix, a device that can excel at "enthusiast" applications like video transcoding and gaming, but struggles with a basic web app or YouTube. It seems Joe consumer -- the supposed target of such a device -- will gravitate to the Revo for its low price, but might be a bit disappointed by the seeming inconsistency in performance, or confused by the need to buy an external disc drive. High-end users will know exactly how to put the Revo to good use, but for a couple more hundies they could get a lot more CPU power in perhaps a Dell Studio Hybrid or Mac mini. We're sure the market will solve all this -- there's no denying that it's a lot of bang for the buck -- but we'd say nettop manufacturers should try pairing Ion with higher performance chips as soon as possible, and hopefully they can hit a bit broader of a target. Note: we experienced occasional crashes during testing. After speaking with NVIDIA, it sounds like there was a glitch with our unit, and they're sending us a replacement to test and see if we can replicate the errors -- we'll let you know if they crop up. The device has been extensively tested by NVIDIA and outside parties in the exact same tasks we performed and no one encountered the problems we had. We're lucky like that.